1. How do you describe the nature of the Indian toy industry? Who are the major branded/organized players in the industry? Dominated by unorganized imports to the level of 85% shelf share, the organized toy industry had not been in great shape over the past decade or so. Funskool (National distributor for various global toy brands), Mattel (Global multinational brand present by itself in the country), Simba(Global multinational brand present by itself in the country), Mitashi (OEM labels, imports from China), Zephyr (OEM label, domestic production), Winning Moves (National distributor for various global toy brands) have been toy players who have been able to be consistent in the toy market. 2. With almost 90% of the Indian toy market being filled with unorganized/local players, how do you think the branded/organized players have been playing the game? Most global brands are present in the country through a representative aggregator/ distributor. Most have been lying low for the past decade and waiting for their turn to invest and entice the biggest kid market across the globe – Post GST, hopefully tide will turn. 3. What according to you would be the size of the Indian toy industry and what are the different segments of the Indian toy industry? Who are the major players in each of these segments? 4. What according to you are the five Critical Success Factors for any of the organized/ branded players in the Indian toy industry? Product selection with high play value/ Presentation + Price Point/ Wide and dense Distribution Channel/ Marketing – BTL & ATL/ Agility to move with trends. 5. Of all the organized/branded players which one do you think has understood the Indian consumer psyche and adapted itself to leverage the market potential? It’s an absolute misnomer that the Western Biggies dominate the Indian market. India is a largely unexplored market from the international brands’ perspective. India is a INR5,400 crore toy market with the biggest multinational toy brands in India barely operating with a turnover of INR100 crore and that too being just a couple of them. And, this is post having 25 years plus presence in the country with multitude of strategies tried and tested. A decent-sized unorganized importer sitting in a wholesale market does a bigger turnover than the so-called “biggies” and with better bottom lines. The first seed inducted in every professional working with Imagician Playthings is defining the market and competition right. Once we have done this, we are not targeting the INR650 crore organized market, but INR4,500 crore which allows us a clearer view of our pricing and product strategy. 6. What according to you are the five major consumption patterns in India with reference to toys? Toys primarily a gifting commodity, INR499/ consumer price is the sweet spot, educational toys are preferred by parents, younger the kid – more brand conscious the parent, not a planned, but impulse purchase. 7. One of the intriguing factors in the Indian toy industry seems to be the average spend of kids on toys. While it is INR250 in India, it is about INR18,000 in UK. While the gap seems to be indicating the inherent market potential, what should be done to bridge this gap? 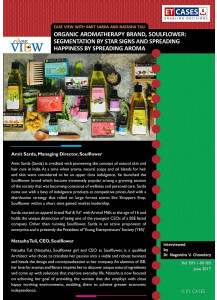 In absence of sizeable business owing to limited assortment to excite an Indian kid which is relatively unkind to a parent’s wallet, most of the so called “international brands” have not been able to go on promotional drives to create consumer pull and are more of “imported labels”. Labels can not, and will not command a higher price tag against similar (generally unorganized) imports available at a 60% price difference. It’s a vicious cycle that international brands have not been able to get out of. Many international brands who have been playing the “Wait & Watch” game due to mixed results achieved by currently active multinational brands and resisting to directly talk to Indian kids for a very long time. Once they start coming in and investing, we will have a robust market with lot of dynamism around it. 8. Do you think Chinese have played a spoilsport in the Indian toy market? If yes, what according to you would be the approach to deal with the same? Let us accept it – Indian Toy Industry is nothing beyond toys made in China. Even the biggest international Toy Brands have their manufacturing facilities in China. With 85% of Indian toy consumption hovering around toys manufactured in China, we need to understand that for at least the next one decade in the view, things are not going to change drastically. Also, why blame Chinese Toys ? It is the selfish motives of customs department (wanting to allow un-safe/ unauthorised pirated toys/ undervalued toys a free entry) and wholesellers & Retailers (bringing in under-invoiced toys, thus evading duties and taxes), Non willingness of weights and measurement deptt to ensure execution of legalities at retail is the real spoil sport. 9. What according to you would be the five important lessons that can be learnt from the unorganized players in the Indian toy industry? 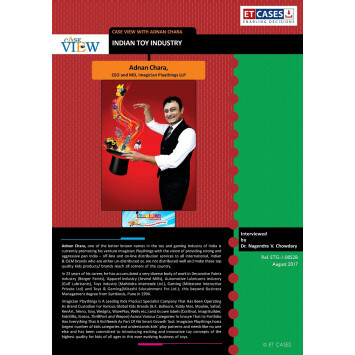 Fortunately or unfortunately, the success mantra of a toy industry player needs to be learnt from the hugely successful and dominant unorganized sector which flourishes on quick responses to consumer demand by bringing vast variety of toys at prices which do not pinch the consumer’s pocket. (a) Keep ears to the ground to do quick inventory turn around. (c) Close relationship with B2B customers. (e) Crunch in real estate is a real bottleneck – Accept the same while evaluating outputs. (f) Current volumes for organized marketers not fit to take on high overheads – Only the “lean and mean” will survive. (g) Kids preferences for brands and categories very fickle, product life cycle incredibly short – Product selection remains key. (h) Basics never go out of fashion, allow penetration – Need to have consistently in supplies. (i) GT (Mom & Pop/ Specialist Stores/ Corner Stores) has ruled, rules and will continue to rule – Nurture widespread channels. 10. What have been the biggest retailing challenges for Indian toy industry? Managing variety across categories – Tracking category trends – High cost of real estate – slow moving/ dead inventories. 11. What according to you would be the impact of GST on branded/organized players and unorganized players? Who would be impacted the most? Adnan Chara, one of the better known names in the toy and gaming industry of India is currently promoting his venture Imagician Playthings with the vision of providing strong and aggressive pan India – off-line and on-line distribution services to all international, Indian & OEM brands who are either un-distributed or, are not distributed well and make these top quality kids products/ brands reach all corners of the country. In 23 years of his career, he has accumulated a very diverse body of work in Decorative Paints industry (Berger Paints), Apparel industry (Arvind Mills), Automotive Lubricants industry (Gulf Lubricants), Toys industry (Mahindra Intertrade Ltd.), Gaming (Milestone Interactive Private Ltd) and Toys & Gaming(Mitashi Edutainment Pvt.Ltd. ); this beyond Business Management degree from Symbiosis, Pune in 1994. Imagician Playthings Is A Leading Kids Product Specialist Company That Has Been Operating As Brand Custodian For Various Global Kids Brands (B.K. Balloons, Kiddy Mat, Mookie, Safsof, RenArt, Tekno, Tosy, Wedgits, WavePlay, Welly etc.) and its own labels (Craftival, Imagi Builder, KidsVilla, Kratos, ThrillPort and Wepon) Across Various Categories To Ensure That Its Portfolio Has Everything That A Kid Needs As Part Of His Smart Growth Tool. Imagician Playthings hosts largest number of kids categories and understands kids’ play patterns and needs like no one else and has been committed to introducing exciting and innovative toy concepts of the highest quality for kids of all ages in this ever evolving business of toys.